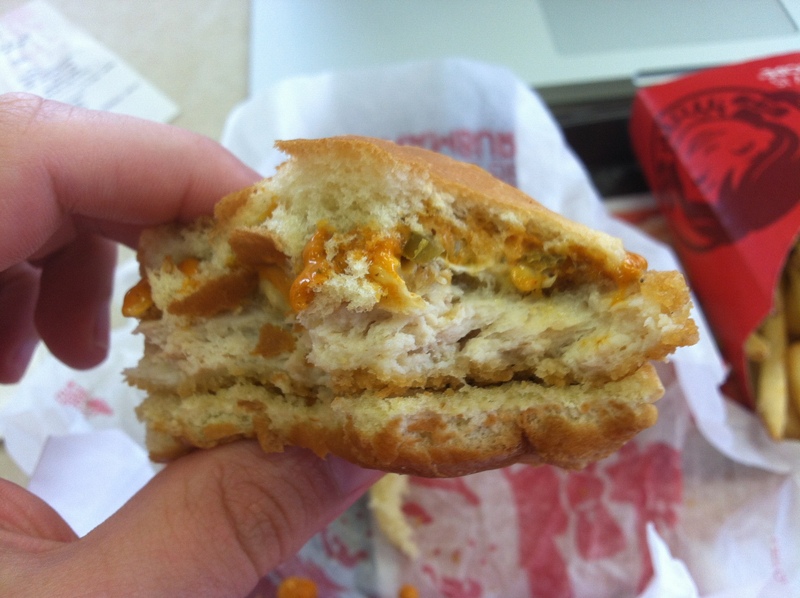 I’ve always had a love/hate relationship with Wendy’s burgers. On the one hand, they are damn tasty. Dave Thomas certainly didn’t cut any corners when he designed them (get it?! ), and he left a lasting legacy of an underrated burger. On the other hand, they are really messy. Messy to the point where I could probably count on one hand the times I’ve eaten one without it either falling apart or getting all over my hands. Wendy’s also has been at the forefront of the bacon craze, or at least more so than the fast food giants at McDonald’s and Burger King. They introduced their applewood-smoked bacon a few years ago, and they seem to make more of an effort to feature their bacon and make it more than an afterthought. Putting those thoughts out there, let’s just say I was looking forward to the Ciabatta Bacon Cheeseburger with cautious optimism that Wendy’s would not let me down. 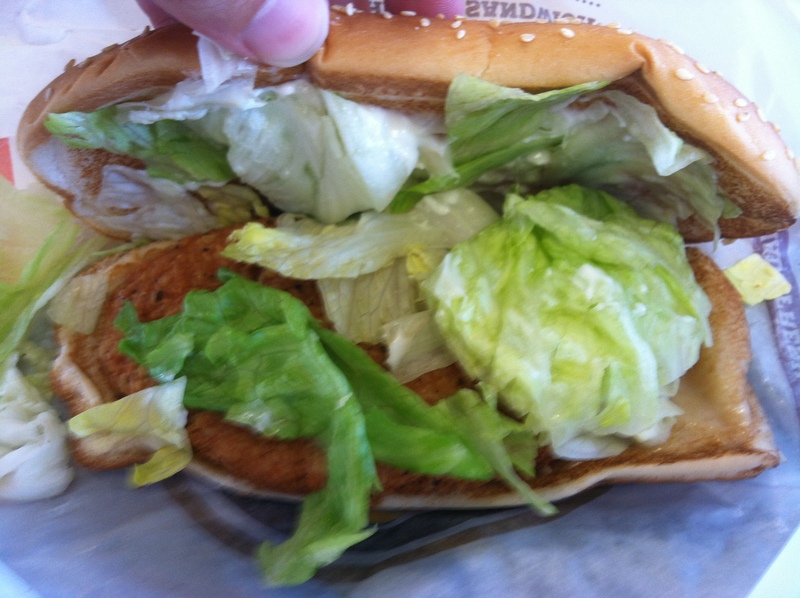 As I mentioned in my last post on the Spicy Chipotle Crispy Chicken Sandwich, I dined in for this meal. At this point, eating at the restaurant is probably the only way to ensure the best possible experience, and from now on, I’ll only note this if I get drive-thru or something extraordinary (good or bad) happens. And in this case, I stayed for a bit after I finished eating, and the server took my tray! That was quite nice and unexpected! Anyway, I got the meal, medium size, which was $7.48 before tax, and my whole meal (including the Chipotle Chicken Sandwich) was $9.54. Not too bad considering the massive amount of food I consumed. Let’s just say I earned my salad dinner that night. The sandwich came in a box, but with no paper wrapping around it, which made me a little nervous. At first glance, this is a pretty sandwich. With the contrast in colors between the ciabatta, lettuce, burger and cheese this actually looked fake, like it was a plastic model used for the commercial. The burger was easily the most attractive sandwich I’ve had so far. It also smelled damn delicious. While this is probably entirely due to the bacon, I couldn’t wait to tear into this thing. 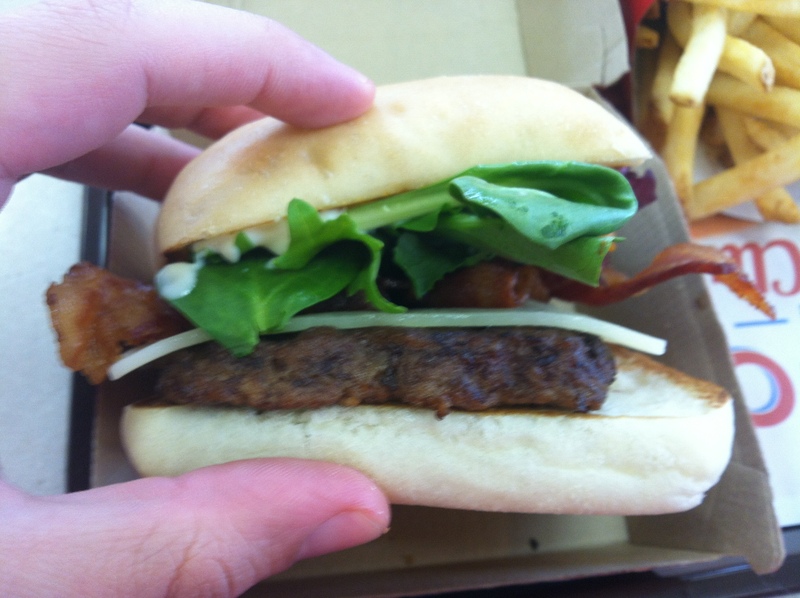 The Wendy’s marketing department says the Ciabatta Bacon Cheeseburger is “a quarter-pound of hot ‘n juicy beef topped with roasted, chopped tomatoes, creamy, rosemary garlic aioli, fresh spring mix, natural Asiago cheese and applewood-smoked bacon between a toasted Ciabatta bun.” I took a quick bite of the bacon before I dug in. It was nice and crispy, with a good smoky flavor. I knew this already, I just wanted a piece of bacon before I began. Upon first bite, the first thing I notice is the Ciabatta bun, and not in a good way. It tasted stale. I can’t believe it had gone bad already since this promotion just started, but this bread was not good. 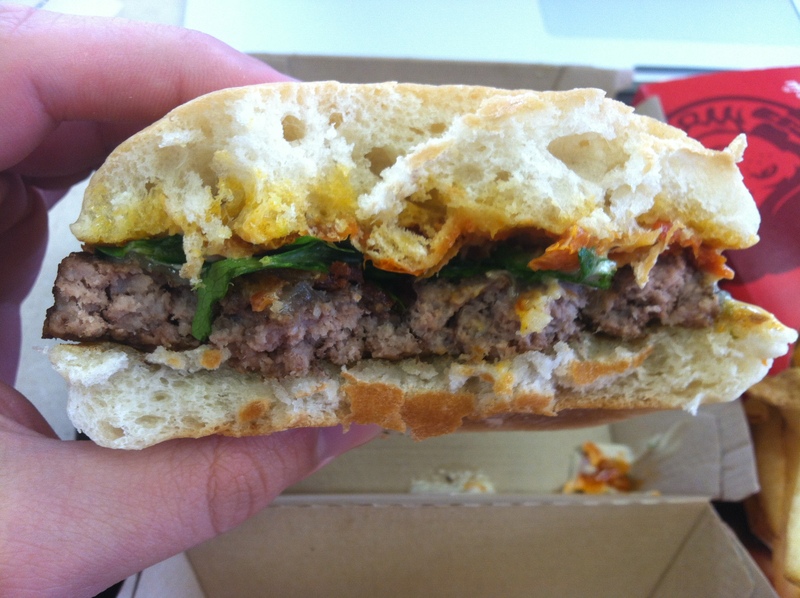 Bread is the easiest part of the burger, why do we keep screwing this up?! This is especially egregious when you make your bread part of the marketing of the sandwich. And of course, the aioli also starts seeping out of the sandwich after that first bite, so my expectations have gone downhill pretty fast. However, after I got over the bread, and the aioli didn’t turn into a flood, this was a really good burger. Aside from the taste of stale bread, everything was really well balanced, and nothing outshined the bacon, which was the obvious star here. I’d have liked the burger to not be as dry as it was, but I understand I may not get the freshest food when I eat lunch at 2:30PM. I also want to point out the tomatoes. Normally, fast food tomatoes are barely tolerable. They provide a contrast to the burger, but they’re generally mushy and not ripe. Half the time I wind up taking it off because it’s too gross. Here, the tomatoes added to the experience. They were chopped up, actually red, and had some flavor. What a concept! 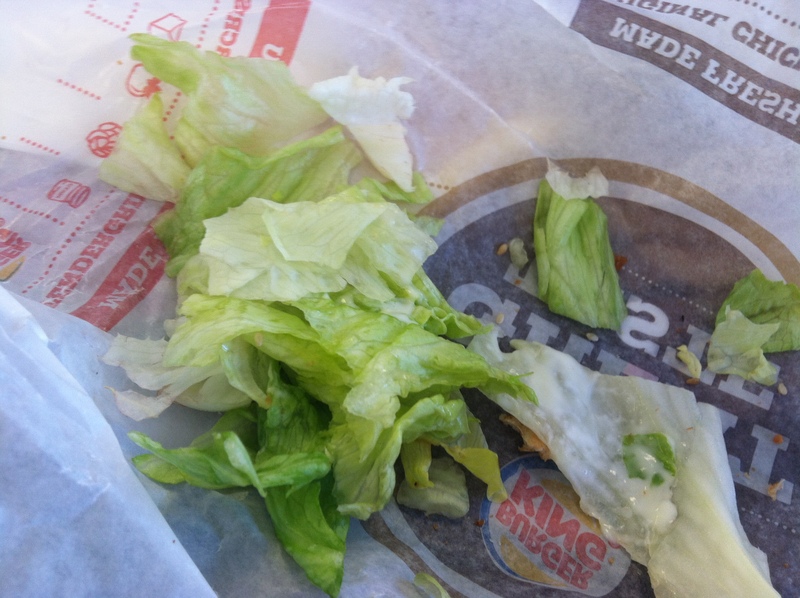 Also, the spring mix is better than the usual limp piece of lettuce. The color was fantastic and it added a nice bite. The aioli was like a creamy Italian dressing. I really liked it, and it was noticeable when I took a bite without it. 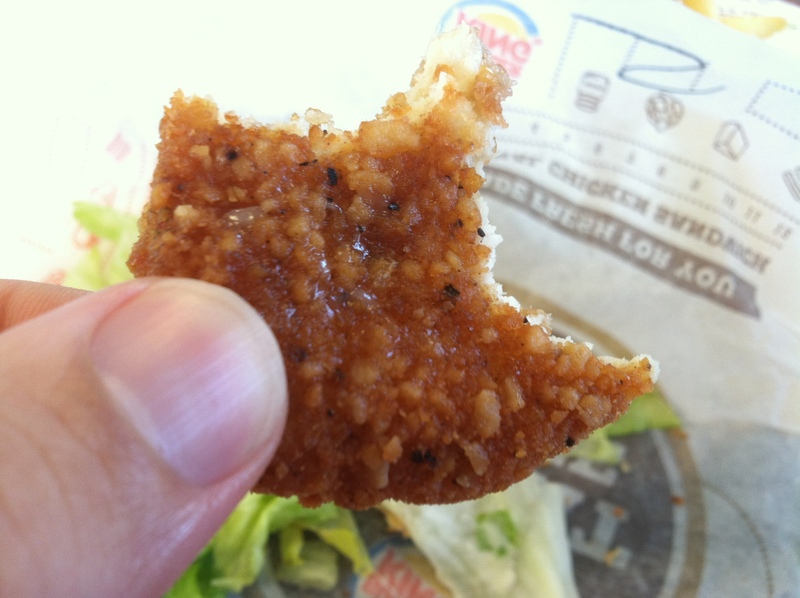 Between the stale bread and the dry patty, bites without sauce were not good. The patty also could have used some seasoning, even if it was just salt. 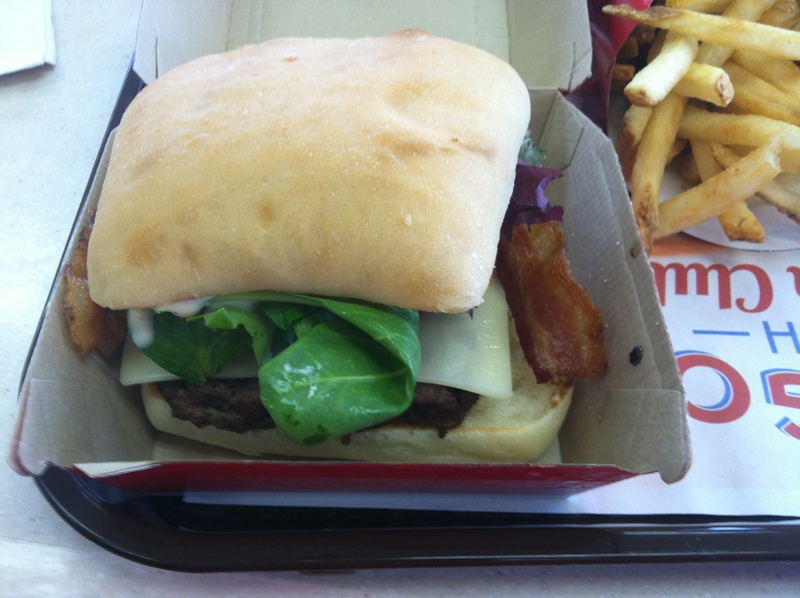 No reason for the burger patty to taste so plain. There were some drawbacks here, but a fresh piece of bread and some salt could fix them, so it’s not like they ruined the experience. This was a fantastic burger. It was filling, had a great taste and wasn’t messy. While eating, I was enjoying it so much that several times I had to stop myself to make sure I was writing notes and taking photos. 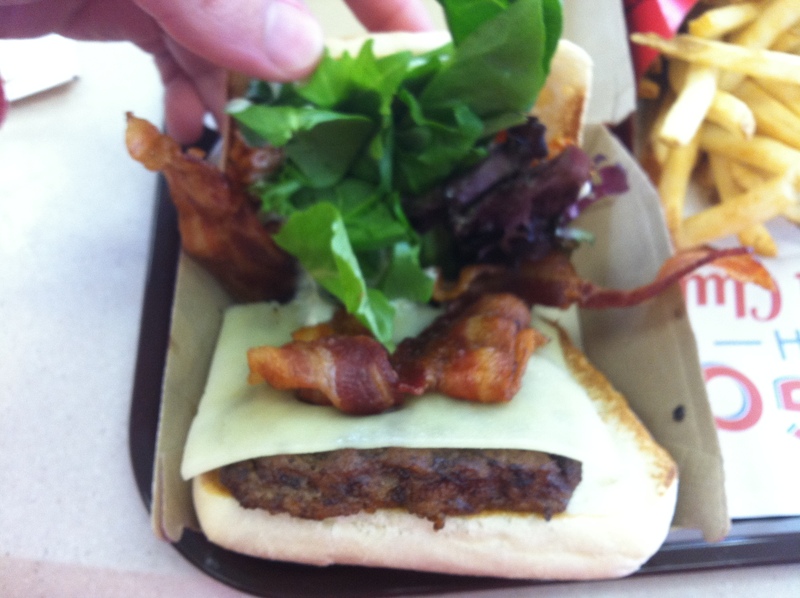 If you like bacon burgers, get to Wendy’s before they take this away. It’s worth the trip. Before, I end, two more two quick notes. 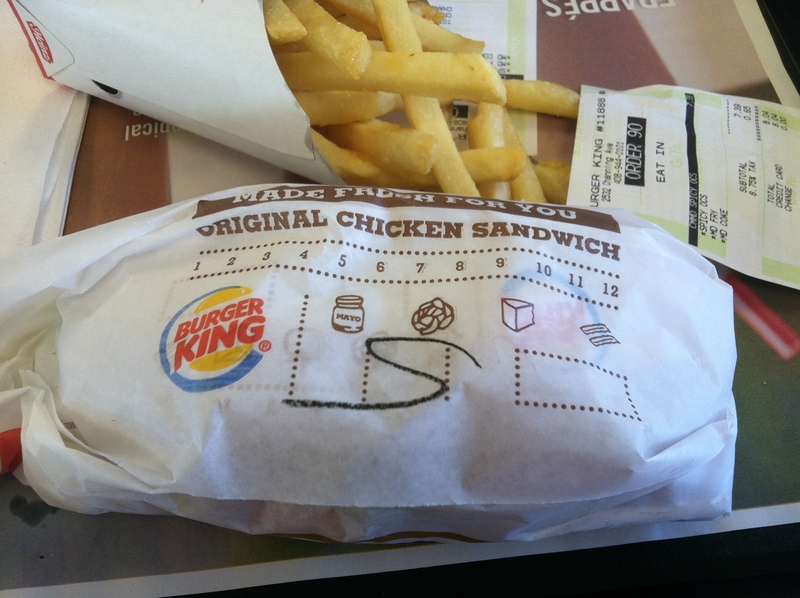 First off, just like last week, somehow there was also a hair on this burger. Luckily it was a small strand on a piece of bacon that was outside the bun, so I could just rip off that piece and continue eating. But seriously, two burgers and a hair on each? That was disgusting and all the good service in the world can’t overcome that. Use those hairnets. 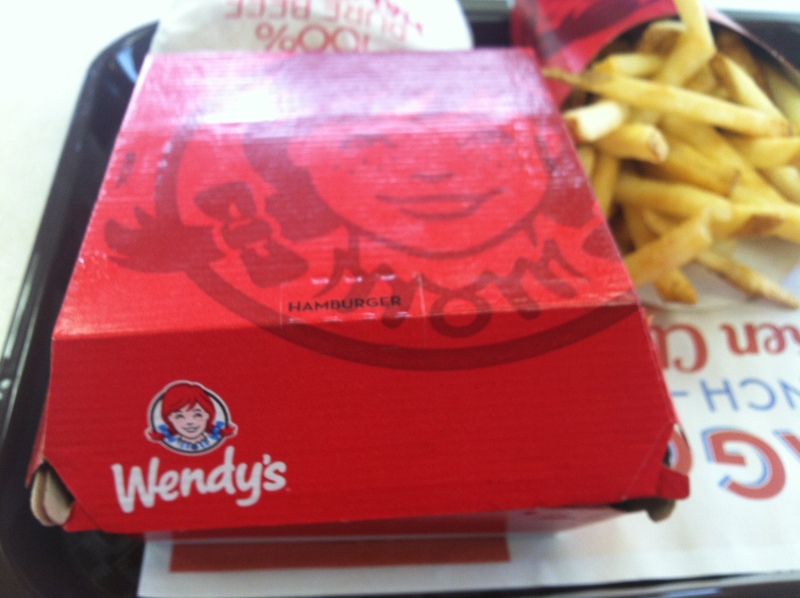 The happier note: I hated when Wendy’s changed their fries a few years ago. Their old fries were wildly inconsistent (ranging from excellent when fresh to borderline inedible when not), but the new ones tasted like frozen fries (which they are, but still shouldn’t taste like it). They traded uniformity for potential. I’m happy to note that eating them during this trip for the first time in over a year, they were decent. Still way too much salt, but they aren’t something to be avoided in favor of chicken nuggets anymore. Think of this post as an appetizer for the main course. I haven’t purposefully shied away from value menu items, they just haven’t been as pressing for me as premium offerings, since I’m more likely to order a combo meal, as opposed to building a meal from the value menu. However, those items deserve attention too. Value item posts may be a little briefer than regular items (notwithstanding this long-winded introduction), but I’ll try not to ignore them in the future. Onward, ho! Wendy’s has been advertising their value menu chipotle sandwiches for some time now, so I’m happy I stopped in last week so I could finally try one. Since my main meal was a burger, I decided to try the Spicy Chipotle Crispy Chicken Sandwich, so the taste would be completely fresh. From the outside, this isn’t a large sandwich, but it doesn’t need to be. It’s price is only $1.29, and it works as an addition to a combo meal or as a quick snack. 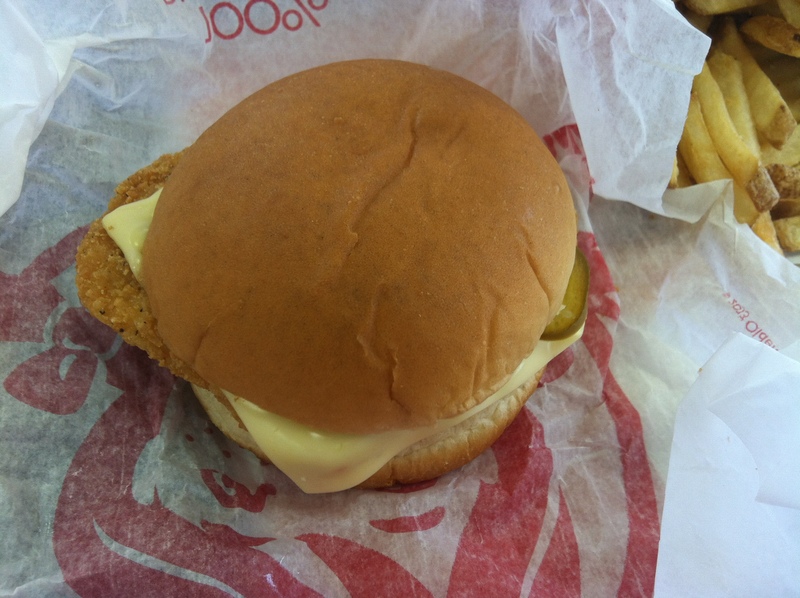 Wendy’s describes the sandwich as a “crispy chicken patty loaded up with pepper-Jack cheese, zesty jalapenos and spicy chipotle sauce.” As a big fan of their Spicy Chicken Sandwich, I knew they wouldn’t let me down and not bring some spice to the proceedings. The chicken itself was good. 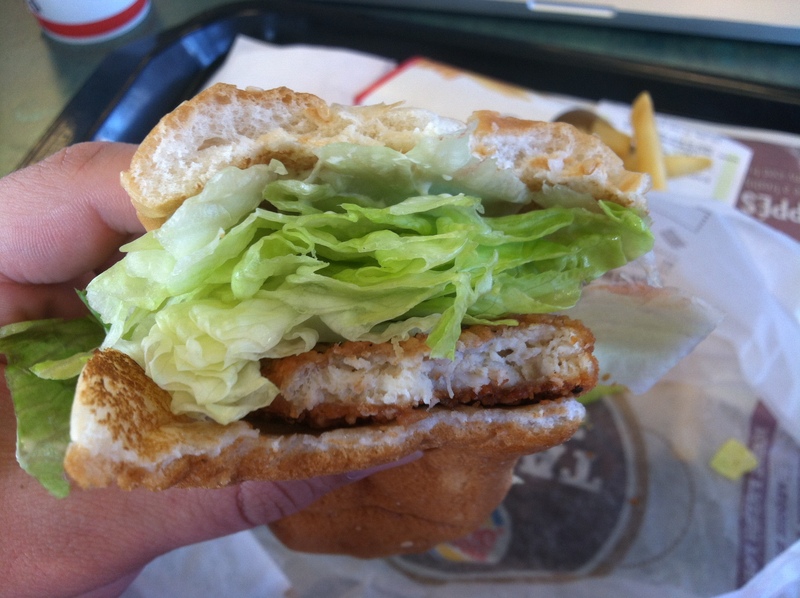 The breading has a nice crunch, and the patty was surprisingly juicy. I tried one of the jalapeños on its own and zesty wouldn’t be the word I’d use. They were pickled. 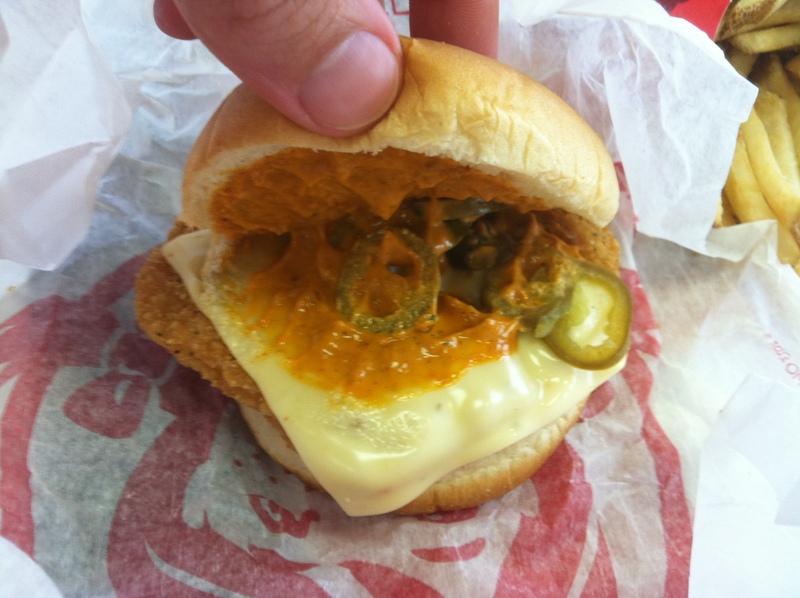 Pickled jalapeños are good, so I don’t know why Wendy’s needed to obfuscate the actual flavor. As for the heat, I could definitely taste it, but it wasn’t overwhelming. Perhaps that’s because the peppers are sliced very thin. The thinness made me worry they would get lost in the sandwich, but they held up well. Also (surprise, surprise! 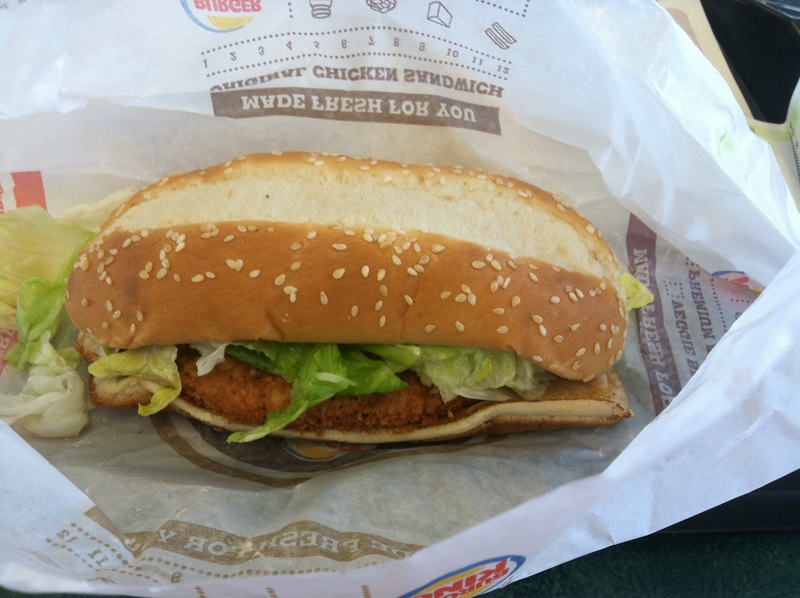 ), the jalapeños were only on one side of the sandwich. I generally like pepper-jack cheese, but a full slice is probably too much for a sandwich that isn’t very large. Before I got a bite with everything, the cheese was taking over the taste of the sandwich. When I finally got a bite with all of the elements, it was pretty good. Like I mentioned with the jalapeños, you could definitely taste the spice, but I wasn’t gasping for water. 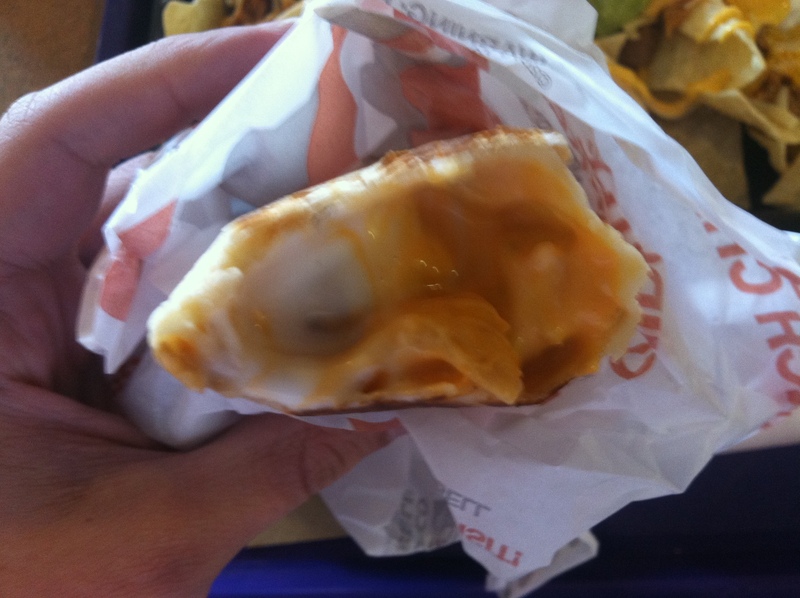 The spicy chipotle sauce was bright orange with some red flecks in it. The color was… uh, bright, and I understand that it may be off putting for some, but it didn’t taste disgusting. Also, and this is very key, the sandwich was not over sauced. I appreciated not needing to wipe my face after every bite. I’d call this a successful sandwich. One minor tweak may be to give a half slice of cheese, like McDonald’s does with the Filet-O-Fish, just to prevent the cheese from being too prominent, but it isn’t a deal breaker. If I’m at Wendy’s and want something to add to my combo meal, I generally go for chili with cheese, but I’d consider this as a substitute in the future if I wanted something with chicken and not beef. One last thing, and though I hate to end this on a down note, I feel like I should mention it. 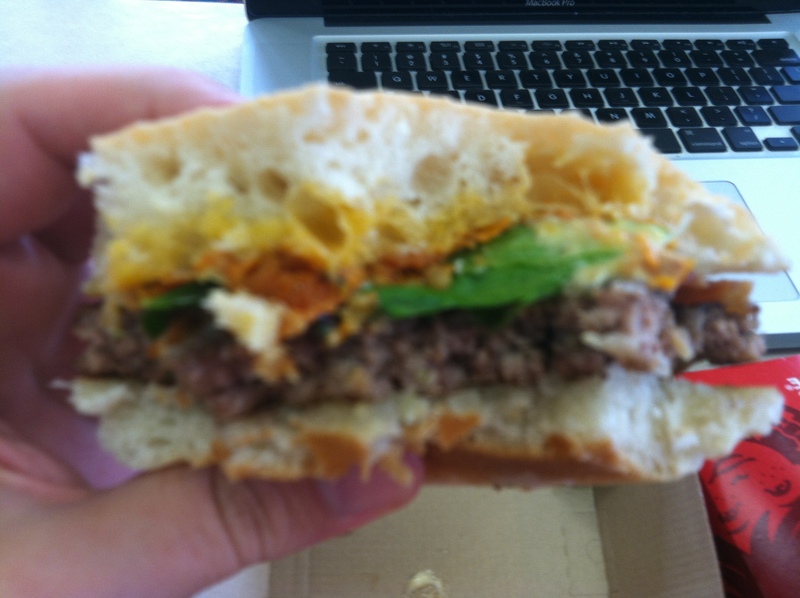 There was a hair on the burger, so I didn’t actually eat the whole thing, I wound up ripping about a 1/3 of it off. Normally I wouldn’t mention this, but as I’ll write in my next review, there was a hair on that burger too. That kinda ruined the experience of the lunch. I dined in again this week. With all the cheese and ranch, I was worried about congealing. I think it helped. As for my order, I got the Loaded Grillers, a taco, and the XXL Shredded Chicken Nachos (sidenote: they were MUCH larger than I’d anticipated, and thus did not finish my food), for the grand total of $10.85. Great value for a mountain of food. The Loaded Grillers themselves are $1, which seemed like a pretty good price. They’re small, but filling on their own. Two or three would be enough for a meal… if you were willing to make a meal out of these things. They look like soft tacos when they’re in the wrapper, and when unwrapped they look like soft tacos… but bigger, both in length and girth. I opted for Chipotle Ranch Chicken first because of the sauce and cheese, and that was definitely wise. 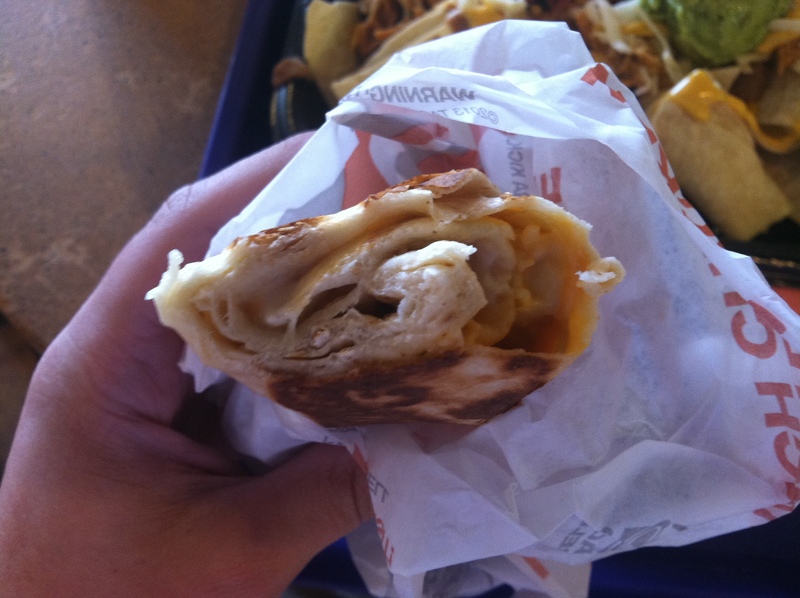 This would have been pretty gross if I’d let it sit for too long, since it’s just chicken, cheese and sauce. 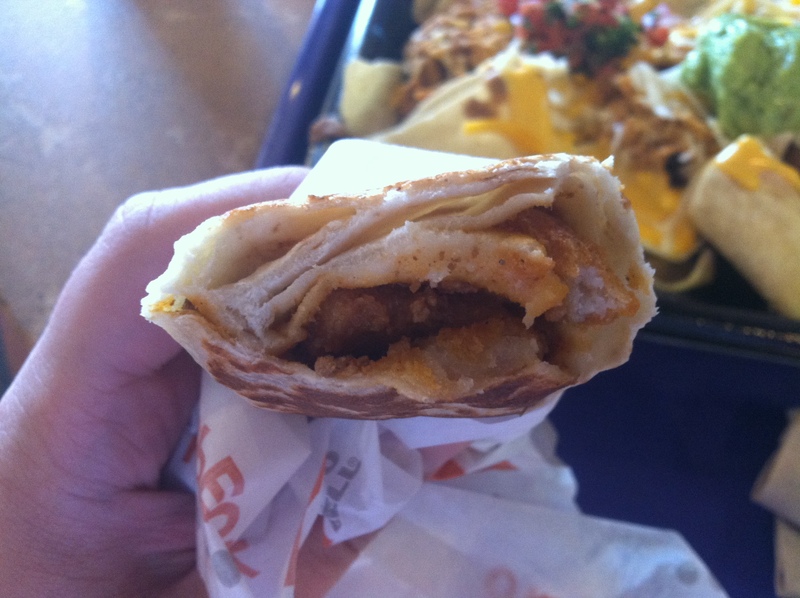 Taco Bell says the Chipotle Ranch Chicken Loaded Griller “delivers the taste of spicy chicken wings with ranch dip because we take our grilled, all white mat, marinated chicken and cover it with kicked-up Chipotle Ranch Sauce and cool reduced-fat sour cream, then wrap it in a warm flour tortilla and grill it.” That’s a mouthful! (You can groan if you’d like). 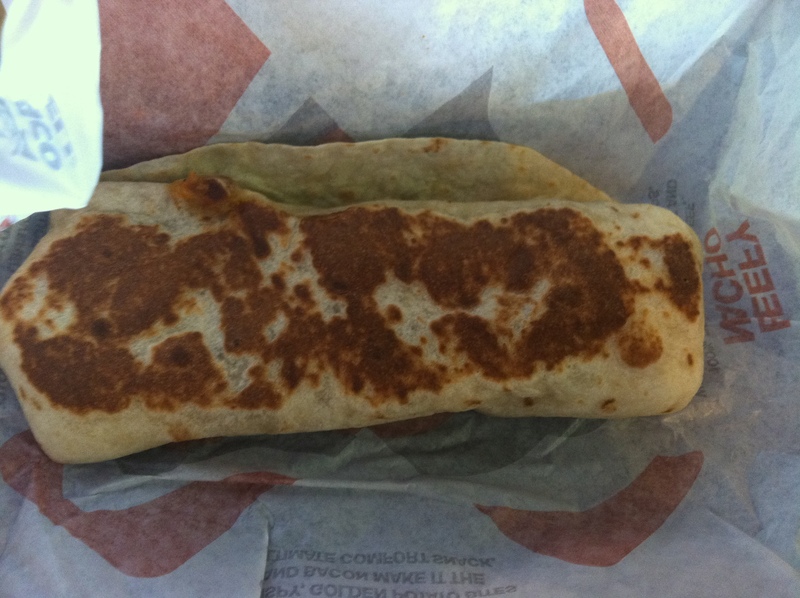 First three bites… all tortilla. This is something I seem to harp on every week, but seriously: can we figure out how to properly proportion food? It’s difficult to stay excited about something when I’ve already eaten a quarter of it and only tasted bread. 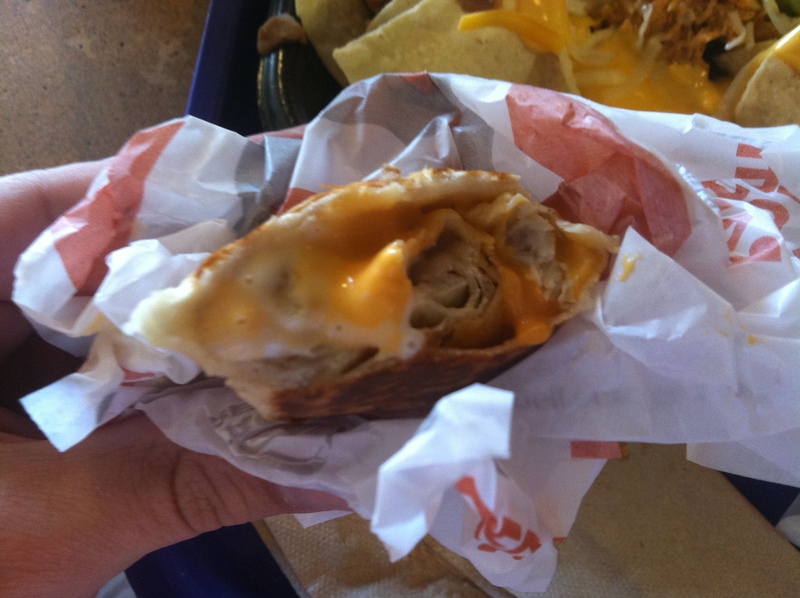 So of course on the fourth bite, sauce explodes out of it. There was so much sauce that after every bite I had to wipe my mouth. It seemed a little overkill. That Ranch Sauce is very tangy. It really overtakes the whole experience, especially since there was so much. I noticed the cheese, but couldn’t really taste it. It just blended with the ranch. 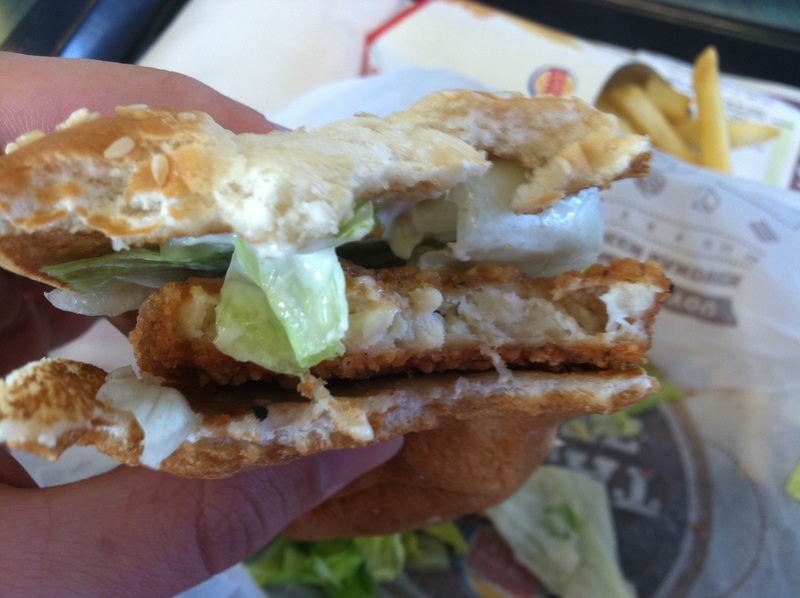 Probably not the most appetizing photo I’ll post on this blog. When there was a good proportion of all the ingredients, this was actually pretty good! There were only two pieces of chicken in the first half, but the second half had a much better balance, and the chicken definitely stood up to the Ranch Sauce when it was there. Given that this is only $1, it’s a pretty good deal. If they could just add a little less ranch, it would be something I definitely recommend. However, as of now, unless you really like Ranch Sauce, you may want to stay away. Be warned though: get extra napkins. Sauce was everywhere when I was eating it. Now, onto the main event: the Chili Cheese Fries Loaded Griller! 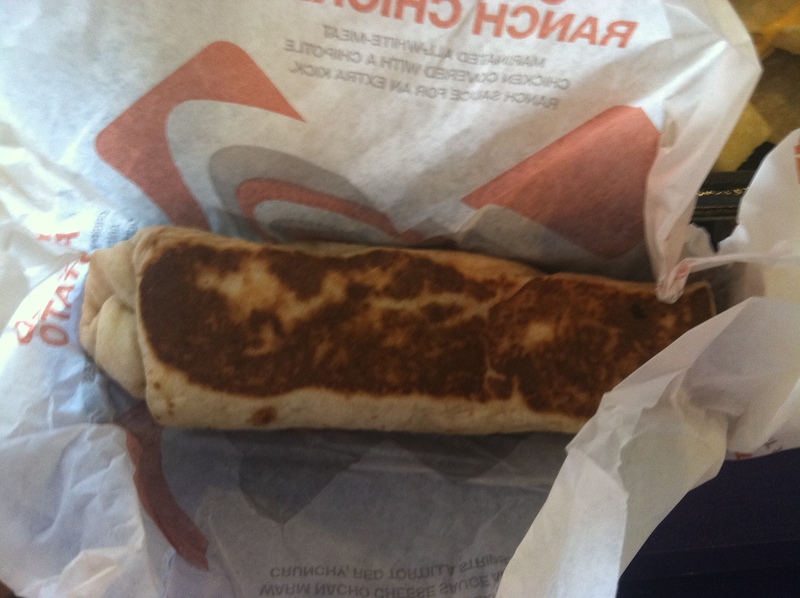 Even before the cashier was salivating at the thought of this when I ordered it, I thought this had a chance to ascend into my regular rotation of Taco Bell food. 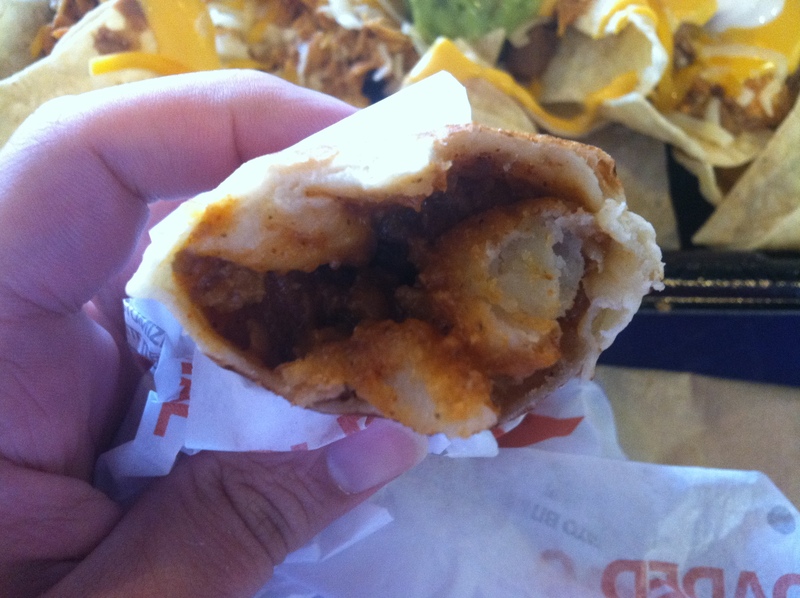 Taco Bell’s potatoes are underrated, and should occupy a more prominent spot on their menu. If the chili was passable, then this would be good. Let’s see how Taco Bell describes the Chili Cheese Fries Loaded Griller: it “delivers the taste of chili cheese fries because we take our crispy potato bites and cover them with our savory chili and warm nacho cheese sauce, then wrap it all up in a warm flour tortilla and grill it.” That comes across as so understated compared with the Chipotle Ranch Grilled Chicken. So once again, the first few bites were only tortilla. Ugh. Once I got to the middle and tasted everything, this was good. Really good. The chili wasn’t particularly spicy, and was more like a meat sauce (so no beans; for you heathens who prefer chili without beans, you won’t have any trouble adjusting). It complemented the crispy potatoes really well. And once again, those potatoes. They maintain their crispiness, so there’s some actual texture in here, as opposed to mush. 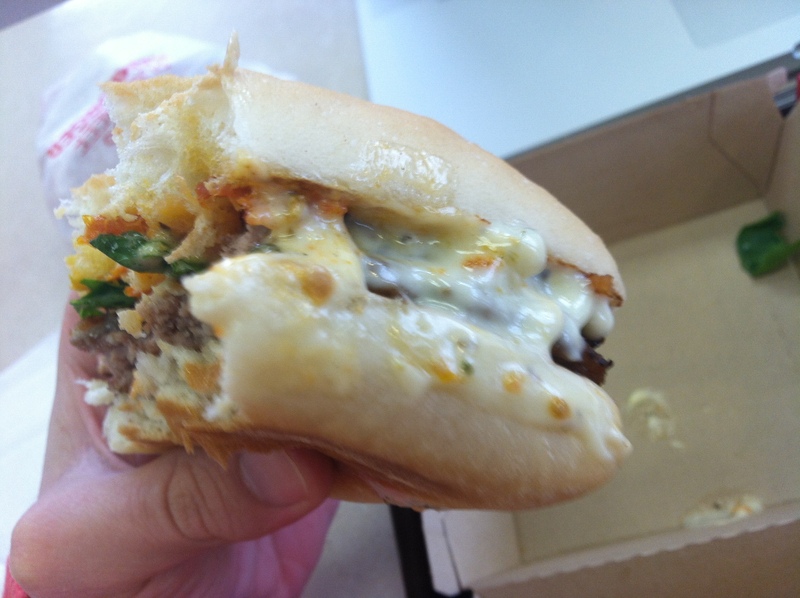 Seriously, the Chili Cheese Fries Loaded Griller is the best thing I’ve reviewed so far. 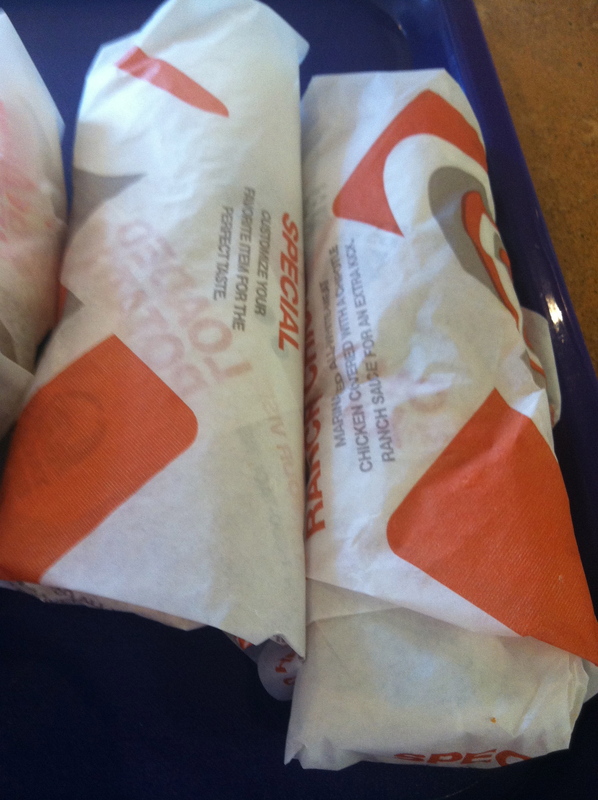 Instead of going overboard and adding some overpowering ingredient, Taco Bell kept it simple, and I appreciate it. The flavors work well together, no one tries to outshine and the other. In addition, this wasn’t messy at all (perhaps because chili is more solid than a sauce). At $1, this is definitely something you could add to a meal if you’re hungry and looking for something a little more substantial than a taco.